What Version of Firmware is Currently Installed? 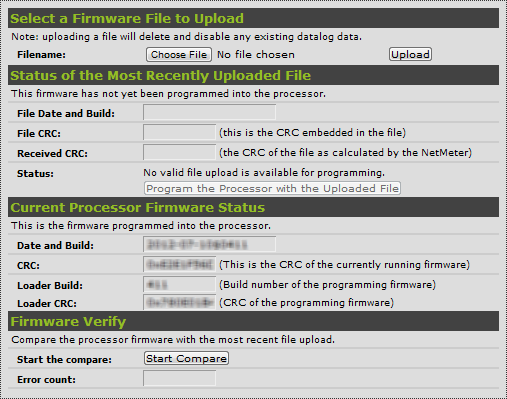 Your firmware version can be determined by viewing the Setup System Status screen. The important value is the FW Build Number. You can compare the Build Number with the avaiable releases below. Do not attempt to downgrade your firmware to an older build version than the factory original. Otherwise, the NetMeter may cease working and require re-programming at the factory. Fixed problem in Data Push API where certain combinations of selected data may produce incorrect data to the server (this change was introduced in Build 0746). Changes between Build 0746 and Build 0749 are related to manufacturing optimizations and will not affect the user experience. For devices with Build 0746, there is no advantage to upgrading to Build 0749. A new Pmax feature has been added to the advanced datalogger. It allows peak power to be detected and datalogged. Several enhancements for greater robustness of the Push API that was introduced in Build:0744. Added the data push function similar to the NetMeter-OMNI. Added a "Views" navigation tab that allows user defined links to be stored under the "Views" menu item. Added a Configuration Save/Load capability under the Setup menu (described here). Added some API features required for a future Analytics add-on. Some minor user interface enhancements were made including additional parameters for the ilog.html widget. Some fixes and changes to Modbus have been implemented: an average voltage register called VAVG(A+B+C) has been added (data element 40263/40264). Non-reporting sum values have been fixed. The floating line frequency value was reporting 100x the correct value and this has been fixed. Added the "Report" tab: allows data from multiple NetMeters to be combined into a report. More information about this feature is available here. Changed the setup process so that the main datalogger is automatically activated when the Sensor Configuration is saved. Also, 2 "green/red LED" icons are shown on the Sensor Configuration page to confirm the status of the Main Datalogger and the Advanced Datalogger. A red LED icon indicates that the Datalogger is not enabled while a green icon indicates enabled. Fixed problem where ModBus value for P(A+B+C) was not calculated correctly. Added feature to better support Excel time format for CSV mode. When data is scaled (using the s parameter) then the time will be reported in the fixed point format used by Excel and there is no need to convert the number. The datalog.csv link in Datalog is now set up this way for convenience. Added the ability to display a 15 min. peak demand graph (P15) for the advanced data logger. When plotting cumulative energy in the advanced data logger, the total energy of the viewable portion of the display is calculated and shown. It is automatically updated when the display is zoomed and panned. An advanced datalog widget has been added to enable real-time updated graphs to be embedded in HTML iframes. Support for 16MB flash memory. All NetMeters shipped since December 2012 have 16MB flash memory. Customers may return their 4MB NetMeters for a free upgrade to 16MB. Contact Z3 Controls for details. Important Note: the process of performing a firmware update may erase data in the Advanced Datalogger. The Main Datalogger will not be affected. If you need to retain the data in the Advanced Datalogger, it can be downloaded to a file in both JSON and CSV formats as described here. This information can be determined by viewing the Setup System Status screen. From the NetMeter web interface navigation bar, click Setup then Firmware Update under the "Setup Options" menu and the following screen will appear. Select "Choose File" and select the file from the zip archive with the ".z3x" extension. Then press the "Upload" button. If the file is correct, it will upload (takes about 60 seconds) and the screen will refresh to show relevant information in the section "Status of the Most Recently Uploaded File"
Before going any further, make sure that your NetMeter has stable power, preferably from a battery backed up UPS. Programming only lasts for about 15 seconds: do not interrupt NetMeter Power during this time. WARNING: loss of NetMeter power during programming can render it inoperable! When you are confident that NetMeter power is stable, then click "Program the Processor with the Uploaded File" and confirm the pop-up button that follows. From the NetMeter web interface navigation bar, click Setup then File System Update under the "Setup Options"
At this point, the update process is complete. However, you may experience odd behavior of the NetMeter web interface due to caching of web content. It is recommended to clear your browser cache contents or hit the "refresh" button on your browser a couple of times to force a reload. 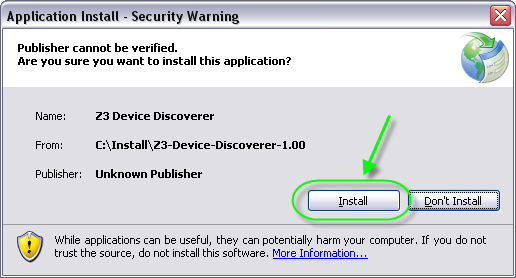 The Z3 Device Discoverer is a program that runs on a Windows PC. It is used to scan for Z3 Controls devices on your local network. It can be used to locate NetMeters on your network if you are having a problems finding them on the network.